This is my entry for the Indusladies 4th Annual International Women’s Day Blog Contest. It’s the first time I’ve entered a writing contest and although I’m excited, I’m also happily nervous! I’ve chosen to write about Women: Burden or Backbone, and my view on the matter is crystal clear – we are NOT a burden. We are strong, proud, gentle, compassionate, resilient, courageous, selfless – fiercely loving mothers, devoted daughters and sisters, passionate wives and lovers, and caring friends. We are many-layered and multi-textured and we carry within us the origins of our World and its history! History is abundant in strong women role models – women have pioneered & served in every walk of life and excelled in them – Government, Literature, Movies, Finance, Media, Entrepreneurship, Teaching, Research, Science and so on and so forth. Florence Nightingale, Amelia Earhart, Jane Austen, Helen Keller, Marie Curie, Maria Montessori, Eleanor Roosevelt, Harriet Tubman, Margaret Thatcher and scores of others have left indelible marks in their chosen fields and serve as inspirations to the millions of us who follow in their wake. Closer to home, we have Mother Teresa, Indira Gandhi, Rani Laxmibai of Jhansi, Sarojini Naidu, Vijayalakshmi Pandit and more recently Kiran Bedi, Kiran Mazumdar Shaw, Anjolie Ela Menon, Anita Desai and youth icons like Saina Nehwal and Sania Mirza; all trailblazers in their chosen paths! And while I salute all these women and their contributions, my own role models are closer to home and no less revolutionary! 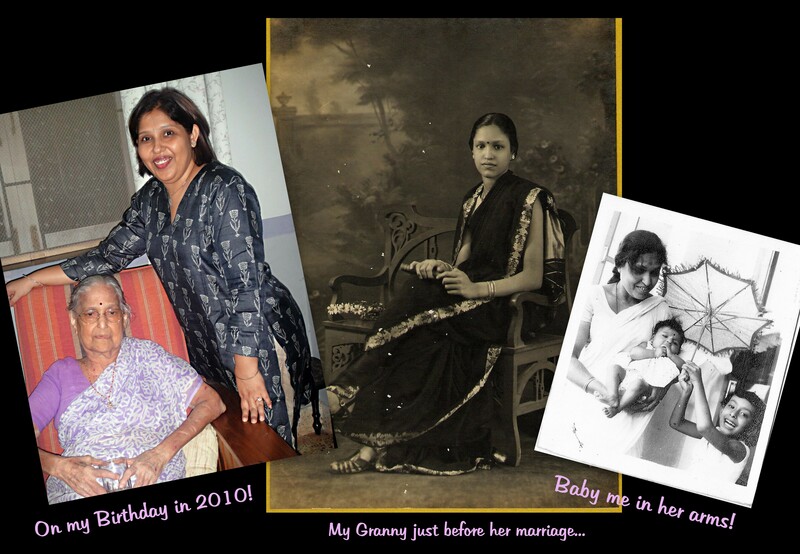 They are my intimate soul mates – women who have known me and influenced me since birth – My Mom, naturally; My aunt, whom I call ‘Didi’, who is my alter ego; but most of all my Grandmother – my ‘Nani’, the proud matriarch of our family and perfect example of a strong, independent woman – her delicate femininity camouflaging her steely resolve. She’s a beauty and a survivor if ever there was one. In her 86 years – she’s survived an abusive marriage, single-handedly raised her two daughters to be strong, independent, good women like herself, battled a continuous stream of health problems, managed financial crunches and coped with the loss of her only & beloved grandson – my brother. Through it all she has managed to be a rock of support for my Mom, who has her own battles to fight – the loss of a child and a husband afflicted suddenly and cruelly with Parkinson’s disease. Her story and suffering are not perhaps unique, after all India has millions of women who have been abused and discarded by society in one way or another and who continue to suffer, but for me – her grand-daughter, it is special and precious, because it is also my story. I come from her and through her and in that way we are inseparable and intertwined forever. When my Granny ended her bad marriage and decided to move back to Bombay (It wasn’t Mumbai then), she had two little children along for the ride, her self-respect, a willingness to do battle, a backbone of steel and little else. I wonder how she found the courage to make such a radical decision in a time when divorce was unheard of and frowned upon. But that’s Granny – at once, rock hard and soft as daisy. She doesn’t like to talk about those days and the subject of her marriage is a closely guarded secret that I’m sure even my Mom only knows bits and pieces of. None of us have ever asked her either, because frankly it doesn’t matter. What matters is that she survived and more importantly she beat the odds in a spectacular fashion! With her family’s support, especially her brothers, she moved in with them and took up the challenge of running the ever-burgeoning household that was the traditional joint family. She managed the servants, the budget, the kitchen and the children – with equal parts of an iron fist and gentle words. She had a reputation of being fair, of standing up to injustice and doing the right thing. She was a seamstress extraordinaire and must have saved a lot of money by tailoring clothes for the large brood of children under her care. She stitched a lot of my childhood dresses too, which were coveted for their fine sewing and cuts. She may not have worked at a job but she was certainly no burden on the family that sheltered her in her time of need. She earned her keep by devoting her life in their service, a fact that in their wisdom they appreciated and cherished. She’s always battled health problems as long as I’ve known her but I’ve never known her spirit to buckle under the stress of the fight. She’s had thyroid surgery, suffers from an inherent steroid deficiency that almost killed her when I was still a child, has had her bones broken in a traffic accident, and most recently has been battling heart disease and the side-effects of long-term steroid use. At 86, she walks with the help of a walker, has to take a million tablets a day for all her conditions, struggles with hearing & memory loss, but she is one of the most ‘robust’ people I know. And by that I mean she still retains a ‘joie de vivre’, which makes me envious and which eludes me at half her age! Even when old age and disease have ravaged her body and left her physically frail, her spirit is indefatigable. There’s a ancient strength in her bones that is secret and elusive. She still manages to make herself useful in the kitchen and I know my Mom will be lost without her when she’s gone. They have lived together now for almost 21 years and my Mom relies on her companionship and advice even today, more so today than all those years ago, when Granny first came to Goa to look after me when my parents moved to Singapore for a few years and I stayed behind to complete my Medical Studies. Perhaps it is only fitting that I call her ‘Aai’ – for that is what she is, the quintessential ‘Mother’, fiercely devoted to her family and passionately protective of us all. When I was born – her first grandchild, there was rarely a moment when we were apart. I was forever to be found perched on her hip and Mom says she took me with her everywhere 🙂 We have a special bond – a bond that has always made me feel a little distant from my own Mom, because I was so close to Aai. She was my confidante when I fell in love and stood by me when my parents were skeptical. She organized my marriage with the aplomb of an event manager and gave me a book of her home-cooked Goan recipes, to see me through my first months of marriage because she knew I couldn’t for the life of me boil water! She stood by us through my brother’s devastating diagnosis of Muscular Dystrophy – a death sentence that would have been the undoing of our family if it weren’t for her spirited support of my Mom, her courage in standing up to my Dad and her unstinting love for me. She showered tiny gold flowers that she had custom-made, on Ishaan before he crossed the threshold to our home the first time ever as a baby, a symbolic gesture of her warmth and love and blessings! He is her only great grand-son and for him she reserves a special kind of affection that he happily reciprocates. When he’s older he’ll understand better how blessed he was to have met her and to have been loved by her. I will make sure he remembers. How can a woman of substance like her be anything but a backbone around which our family assembles and finds succor? I believe it is her love and sacrifice that keep us safe from harm. And again isn’t that typical of all women the world over? This is what our societies are built on – the sacrifices of countless women like my Granny all over the planet. Their love, compassion, compromise and selflessness form the steely backbone on which we lesser mortals build our little utopias. We rise on the back of their labors and once raised we rarely acknowledge their contributions. And still they labor on and love us because that’s what women do. They nurture and nourish and educate, and in doing so they attempt to better a World that often treats them unjustly, judges them harshly and at every turn attacks them and diminishes their worth. How easily we dismiss their contributions! How casually we sweep away their pain! The men they raise and support and suffer & even us daughters – receivers of their boundless benefaction – how easily we forget…until we in our turn become grown men & women, contributors to society, until we ourselves face their same challenges, until we ourselves become mothers of thankless children! Then we remember, and although it’s never too late, I think the fault is ours for ever forgetting. For what would we be without them? And where? So let us remember them and salute them, these women that are an inspiration, these women who are the backbone of our country’s spiritual, financial and mental well being. These women who give freely of themselves that others may prosper and ask in return only the love and respect that is their right and that they have earned. I’m not a great believer in celebrations restricted to particular days on the calendar. The whole approach strikes me as shallow and self-serving, as if the celebration is for us to feel good about ourselves for remembering and not for those that are the reason for the celebration! I think the world would be a much better, gentler place if women were celebrated everyday as they deserve to be – not in grand gestures and extravagant tokens but in quiet sincerity and consistent regard. If they were always treated with respect and cherished by the ones they love rather than celebrated with token gestures on a particular day in a year. The sooner we start, the faster we can expect our worlds to improve. On this Women’s Day, let’s resolve then to honour all women – our own unique tribe – by gifting ourselves and the women in our lives, the gift of respect and of time. Perhaps we can volunteer in an old age home and read to the women there or just sit with them and hold their hands. Perhaps we can connect with a long-lost relative, a forgotten aunt or cousin whom we lost in the chaos of our daily routines. Nothing is more precious than the gift of time and we have received it in abundance from our mothers and grandmothers and our caretakers who have spent lifetimes in our care. Let us begin to give back – and as always in giving we shall be enriched! As for me, I dedicate this poem I wrote on women to my Granny and my Mom – the two women who are my World and without whom quite literally – I wouldn’t exist! They are my backbone and when they need me to be – I am theirs! This is an absolutely beautiful tribute. I am so glad I stopped by to read! I’ll be forwarding this to my own mother, whom I cherish and who is absolutely the backbone of our family. Your article made me pause and think about the women in my life, who have been a backbone to our family, who have shaped me to a great extent and who have emerged successful beating all the odds. Your write up is beautiful to say the least! What an engrossing, captivating read the longer version is…….I give it first prize!! And oddly, it paints such a familiar picture, as if I knew this story all along. You have captured your Nani Ma so vividly and with such an abundance of love, it makes me wistful about my own Nani. I still dream about her sometimes… she pops into my thoughts unbidden, and I’m engulfed in affection. She was such a sweetheart…..a true matriarch, having raised eight children, and lost a few in miscarriages. She was married at the age of fourteen, can you imagine? Loved your photos H! And this line strikes me as true……’……as if the celebration is for us to feel good about ourselves for remembering and not for those that are the reason for the celebration!’…. Aaaaaw….hugs M ❤ Do you know I agree with your comment on the shorter version, 'they don't make them like that anymore'! These are such special women – they had such grace under fire, they never had any trouble making the right decisions, and they made raising children look like a walk in the park! Sometimes I wonder whether genes are doomed to dilution as generations progress?! Still we have strong role models and that leaves me wondering what kind of role models we will be for our kids?